Medical Marijuana now being grown in America’s Garden (State)! You can also check the American Cancer Society's page on Marijuana Use in Supportive Care for Cancer Patients for more detailed info. In case you were curious, the bill passed without too much opposition racking up a 48-14 vote in the General Assembly and 25-13 in the New Jersey State Senate. Democrat Reed Gusciora sponsored the legislation, and made it clear that NJ would be very restrictive in permitting doctors to prescribe medical marijuana for a specific list of chronic illnesses. Actually, the law doesn't even allow patients to grow their own marijuana..or use it in public! Lastly, patients will be restricted to a monthly limit of 2 ounces. We would love to hear your thoughts on the subject. 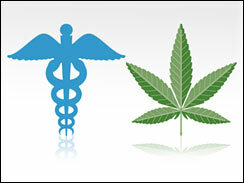 Drop a comment below, or weigh in on our forum poll on medical marijuana usage by cancer patients.